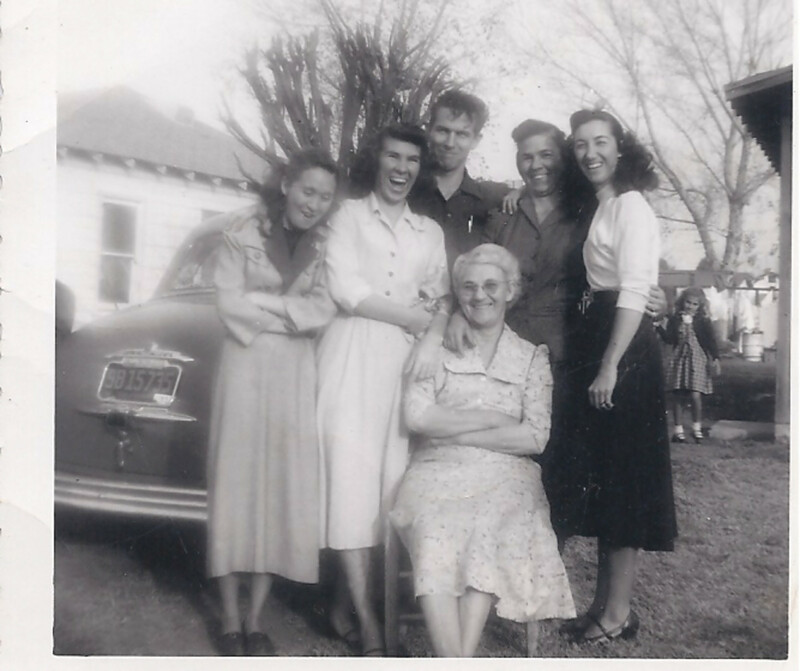 My Mother's mother and family in the 50's. My mother is on the left of my grandmother. My grandmother is sitting in front.... Phyllis (the one burned badly) is located to far left, looking down. 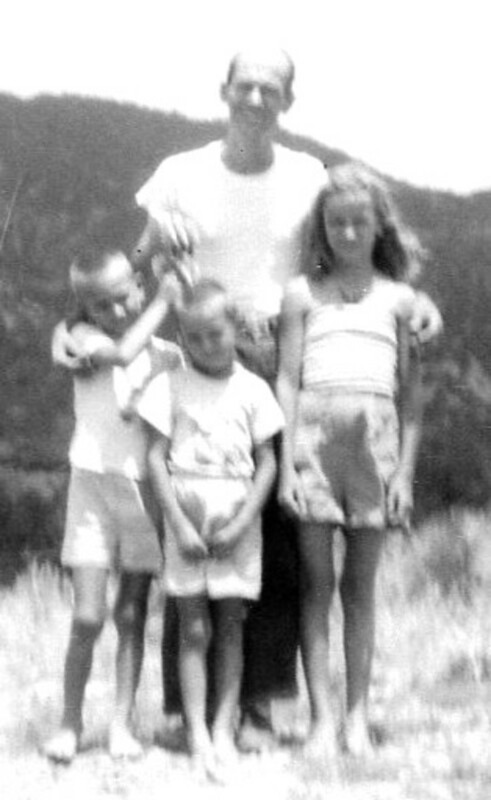 My mother was seven when she arrived at Weedpatch, which was immortalized by John Steinbeck in his 1939 novel "Grapes of Wrath." Like many other Dust Bowlers, who have revived the once-derogatory word "Okie" as a term of endearment and source of pride, she can vividly summon the chapters of her own life: Of no food, no money and disparate for shelter of hot summer nights cooled only by bed sheets soaked with a hose and then draped over the tent. I am writing this as is my mother is the author. This is my mother's voice. It is a rough draft and in her own words. Her mother is my grandmother. The words are my mothers. My name is Dallas. My mother's name is Glenda. She is 83 years young. 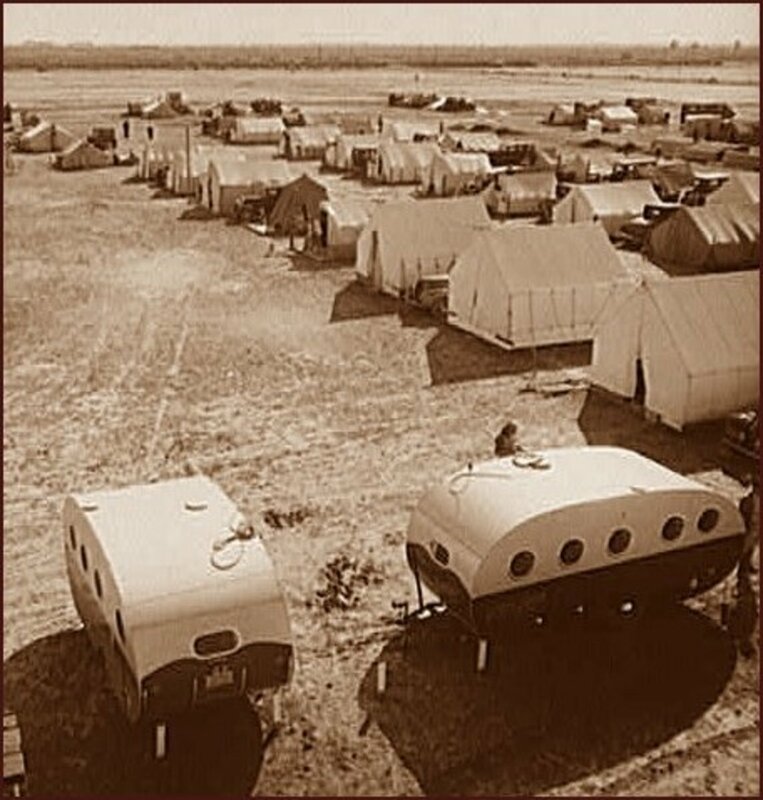 We are living in tents in Midland Texas in 1928 where I was born December 21, 1928. Esther is six years old and can't go to school in Texas or Arkansas until she is seven and is not very happy about it. We leave Texas in an old truck with our belongings packed in tubs. The road is gravel all the way to Mulberry Arkansas. We are going there to live with Grandpa Rucks and Aunt Jane. Mom and Pop have been going back and forth from Grandpas to Texas almost all of their married life. It takes us three days to get there. I am told that 25 miles per hour was top speed. Esther and Edward go to school at Pleasant Hill in Mulberry, Arkansas. Mom decides it is time to move out of Grandpas house and we move to BOWLEGS, Arkansas and this is where I leave my sister’s Esther Mae Rucks Rose's story and begin my journey from BOWLEGS, ARKANSAS to ARROYO GRANDE, CALIFORNIA. "YES, MOM I DO REMEMBER." My Mom says I can't remember carrying shingles up a hill behind my sisters, Esther and Evalee, thinking , I'm as big as everybody else, I'm going to help my Dad and all these other people build this house. I felt very important and grown up. The house was to have a real wooden floor with split wooden logs for walls, and I am helping carry shingles so that we will have a roof over us to keep the weather out. The neighbors have come out of the hills from everywhere to help raise the wall and have dinner on the ground. And me? I'm thinking, “wow,” what a feast, manna from heaven. The men have sawed some tree stumps to be used as chairs. Most of the people back in the hills made their tables, benches, and chairs. My Dad and Mom had even made Edward a wagon, wheels and all. When you have been living, (surviving) on what we called watered down gravy, and whipperwill peas and having a pig sty for a shelter, it makes an impression on a three year old. I think back and I thank God it is now just a memory. Yes, Mom I do remember. After living in Bowlegs for a while, Mom and Pop have decided to move up to Three Rocks in the Ozarks where there is better farm land. We put all our possessions in a wagon and started out over this really rocky road to Three Rock. I was told it was twenty-three miles, but it took all of a long day. Pop, Ed and Esther had the chore of planting corn, strawberries and peanuts. My Dad would get a bucket lid and punch holes in it to grate the corn so that we could have cornmeal for cornbread. Esther would set the table and give my Dad the only plate we had and the rest of us would use bucket lids or pie pans. She and Ed would have to take turns shooing the flies out before we could eat and they seem to have several disagreements whose turn it was. I don't think I knew there was such a thing as a screen door. Mom and Esther would walk a six mile round trip to church when we lived in the Ozarks, to a schoolhouse where a Baptist minister was preaching. Mom would wait until everyone had their turn testifying and then you would get up and testify. You eventually converted all of the people to Pentecost so the Baptist Minister left. Uncle John Rucks, my Dads brother comes and preaches hell-fire and brimstone and baptizes everyone. So many of the people that lived back in the Ozarks had never been out of the hills and didn't know anything about electricity, indoor baths or how things were in the city. One of our cousins, Burns came by in a car. He had just driven in from Los Angeles, California, where he worked as a comedian on the Radio with Bob Burns. All the kids would throw rocks at his car and call him a smart eleck. We move to Pope Arkansas in 1932. Everyone has to catch the chickens and tie their legs with strings and put them in the wagon with some corn and peanuts. We had to keep the chickens away from the corn and peanuts so that we would have seed to plant when we got to Pope. The creek is up so we have to float the wagon across the creek. I guess it didn't bother me much because I don't remember anything getting wet. I remember Mom saying, Homer how are we going to pay the rent and he says, "Guess we will just have to rent it on credit and pay them when the crops come in. The house we move into doesn’t have a ceiling so Esther isn't worried about snakes. The old while leghorn chickens are turned loose and are running around everywhere, coming in the house, jumping on the beds and even on the tables. Mom kept a pot of hot boiling water going so she could poor it over the floor to clean up the chicken mess and to kill all the bed bugs that came creeping thru the cracks in the floor. Esther is fussing about washing the clothes, saying, "I don't know why we have to keep washing clothes, they will just get dirty again." And then she would say, "I wish they would put wells on hills so that you wouldn't have to carry water up hill. I'm thinking she sure is fussing a lot (I'm not having to do any of the work yet) and I think everything is great, trees all around and a creek close by that Mom puts things in to keep cool and puts milk down the well to keep cool. We are having whipperwill peas, poke salad greens and wild grapes and when the crops come in we will have corn, peanuts and strawberries. The twins, Phillip and Phyllis were born in Mulberry Arkansas June 23, 1933. I, Glenda Fae Rucks was born December 21, 1928 in Midland, Texas. Just a year before the crash, that started the "Great Depression" of 1929 thru the thirties. Evalee Rucks Beasley was born February 18 1927 in Kings--mill Texas in another God forsaken tent town in Texas. I was told those were the better days when my dad worked in the oil fields riveting the big oil tanks together. Esther Mae Rucks Rose was born March 25, 1922 in Mulberry, Arkansas and Edward Rucks was born in Mulberry, Arkansas May 27, 1920. When my dad wasn't working, we would stay with my Grandpa Rucks and Aunt Jane. Aunt Jane had these wonderful feather beds that we slept on. I thought they were absolute heavenly. I have very few memories of my Grandpa because he passed away February 25, 1932 with cancer on the back of his neck. I remember Grandpa raking up leaves in his big front yard and I would go jump in the middle of the pile. He would just laugh and rake them up again,- and of him eating bread and milk....his handshakes and the spoon hits the side of the glass and when he got through with his milk he would drink coffee from this big mug sitting in a saucer. Then he would pour his coffee in the saucer and drink from the saucer. The last time I saw him, he was in bed with cancer. I wanted to see him and Mom wouldn't let me, and I remember hearing Grandpa saying, "let that baby come in here." I tried to tip toe as quietly as I could. He patted me on the head and called me his little redhead and that is the last time I remember seeing him. I guess that name stuck because I went thru grammar school and high -school with most of my friends calling me "Red" which I hated. Somehow, it made me feel like a brat. When we lived Pope, Arkansas, everyone was in school but me, and Phillip and Phyllis were still babies, I couldn't decide if I was happy about these new babies or not, I just knew they were too small for me to touch. I went out to find my Dad and discovered a bunch of little chickens (seems like everything is having babies around here). I am sitting on the ground in the middle of the bunch and here comes my Dad. Normally my Dad is a quiet man, "but with a sense of humor." He is trying to talk me away from the chickens and finally succeeds. Here I am, trying to be this nice little girl, stepping in his footprints as I follow him around. I am stretching my legs as far as they will go. I'm thinking to myself, "wow, I'm big," and then woe is me. Seems like by the time I put my foot in my Dads footprint there is a baby chick in it. By the time I stepped on the second or third little chicken, my father with the usually good nature had "lost it." When he gets through with me, I feel like I am going to be responsible if we starve to death. Somehow, my world didn't come to an end. I get over all the hurts and decide I like the twins after all and think we might as well keep them. I choose Phyllis for mine and Evalee chooses Phillip for hers. As the days pass and everyone is either in the fields working or in school I have more responsibility for the twins. When Mom has to go to the well to draw water or outside to do any other chores; I have to watch the twins. I'm really feeling like a big girl but this doesn't last long. I soon get tired having to stay on the bed with them entertained so they won't miss Mom and I have to stay on the bed with them until she returns. (Seems like forever). Out of desperation, I make up this little ditty, "Hoyty Toy Sonny Boy and Hurlity Turl Sister Girl." (They were called Sonny Boy and Sister Girl by the people that knew them when they were small and until they were well into their forties). They soon learn to crawl and I can't keep them on the bed any more. They never seem to go the same direction. They remained that way throughout their lives. We are deep into the GREAT DEPRESSON. Things weren't going well . I had the feeling that nobody is happy anywhere. I don't remember anyone smiling or laughing, no hugs or any sign signs of affection. The only affection I rem ember is a hug from my grandfather Rucks when he would pat me on the head. The first time I saw my mother smile I was eleven years old. I kept telling her to do it again. Esther was the only one that could make her laugh. Not only is it wonderful to read this again, Dallas, but it's special to reread the comments from 7 years ago, when ralwus/Charlie was still among us. I was a newbie to Hubpages. Then more of us 'old-timers' were joining and many are still active on HP, Facebook and other places. Such dear memories of them and a precious reminder of this story of early 20th century life and hardship and the triumph of human spirit. We know better and we will exercise our right November and make a positive difference! "You didn't build that! Somebody else made that happen!" Thanks! ... a heritage built upon work ethics. "A man's word was his contract." Incredible pictures and a great story in the making. The old wood burning stove on the back of the truck says a lot about the times. Fascinating. I have moved and am just now getting my computer back in order. I will review this with my mother who will be visiting in two days for more comments! I do have plans to publish! I just want you know how much I have enjoyed this. My husband (the only grandson of Cathola Reece) had no idea of the colorful history. Ma Hunter aka:Buck,aka Cathola Reece, aka, Mrs Henry Edward Hunter-- had a twin sister named Captola who passed away. Cathola's said her mother name was Ida Balkhouse Reece, dad was Gilbert Lawson Reece. Buck-Cathola Reece Hunter and Henry Edward Hunter had 3 girls and no boys, Pauline,Thelma and Ellen. Pauline had 1 daughter, Thelma had 1 son-The only grandson and Ellen had 2 girls. This is really exciting because my family came to eastern Oklahoma from Mulberry Arkansas. They were the Quesenbury, Waits, Hunter,Price. Several years ago I had the opportunity to take my great-great Aunt Willa Waits to the Quesenbury Cemetary in Mulberry Arkansas.She had setteled in Webbers Falls Oklahoma as did Cathola Reece. She said her dad was the first person killed by the "Skallawags-Carpetbaggers" in this area. During the Dustbowl many of my family went to California, My grandparents died in Kern County, Bakersfield area. This is so awesome that you took the time and ability to record all this information. If there is a book published please let us know. ps. I know there is Wainright, Muskogee County, Oklahoma, but I didn't know there was Wainright Ark. The more I read the more I remember hearing some of the names you mentioned. Your heritege has provided a forum whereby you KNOW what you are writing about. Roots have an impact. We get to decide what kind of impact! Many left an established and pleasant life in the settled East to pursue a western dream, and at great risk. Perhaps they had at least four "necessities," the notion of taking a risk. Our nation is built from calculated risk-takers. You family (and mine) were imbued with the same pioneering spirit that built this great land. The pioneers set out with three necessities: the will, the necessary knowledge, and a few basic hand tools. With those few things, they built a nation. Our family farm was established around the Civil war, and still stands today. Nails were scarce, so the house and barn were constructed of hand-sawn beams, and secured with wooden pegs driven into holes drilled by hand. They made do, just like your family. No wonder you are so proud of them! My mother's family left Arkansas with an old car they had traded a cow for. The lights did not work. At night, my uncle Ed (around 12) would set on the left front fender with an lantern to guide grandpa.. They built first house with boxcar lumber. The kids straightened the used nails. They spent a total of $60 for their house! It is sill there with people living in it! Most of the people now are wealthy. Their work ethic and strong sense of family values provided a foundation of personal growth. Those trailers bring back great memories. In 1951, my father, an out of work iron-worker, took the last of our money and drove from Iowa to South Carolina, an epic journey in those days. He got a job at a massive government project on the Savannah river, across the water from Augusta Georgia, and sent for his family. For a few months, we, a family of mom, dad, my three sisters and myself, lived in a huge trailer park in identical trailers very similar to the ones in your photo. My mother made us recite our trailer's row and number (T-14...I still remember it! ), before we left for school. Funny thing is, with six people crammed inside a trailer barely twenty feet in length, I thought we were wealthy! Thanks! As soon as I complete the fine details of my just released book, Eyes Wide Shut: An Enigma I will complete and begin the editing process. What a fabulous undertaking to do this while you still have your mother to fill in details of that time and place. This will become an excellent book...of that I am sure! People woked together... Tody in small communities people still do the same thing! Wow, what a story--life was so different then and people were definitely more caring --like all the neighbors coming together to build the wall. Times may be tough then but there was certainly more human interaction. Thanks for sharing. This is a great peek into the beginning of a different type of culture for me. You write very well. I am sure your mother must be an extremely interesting person to have lived through these times you talk about. Perhaps an update to my mom's strong, pioneering and fearless personna is our recent experience in my cabin cruiser motoring a 600 mile round trip from Avila Bay (San Luis Obispo, California) up to Montgery, Half Moon Bay, Through San Francisco Bay, up the Deep Water Channel to Stockton, and then Lodi in the Sacramento Delta where there is 1,000 miles of shoreline in Huck Finn territory! Glad you stopped by! "I'll leave the light on for you!" I too share your "roots!" WOW! I'am very proud of my family. This bring's back alot of memories My Mom and Dad came from Bockchito Oklahoma abt 1941 all of the Shadden Clan came out about then, My Dad built a house in Arvin Ca right on the corner of Cardiff and Langford that ole place is still there,there are pictures of my oldest Sister and my two oldest Brothers carrying blocks to My Dad when they were real small My Dad was mixing Cement in a old wash tub,My Mom used to wash clothes on a wash board,We had no locks on our doors and People left there keys in there cars,and if a neighbor got on to You,You would get a whipping when You Got home,no one had much but We all had each other,We are all a product of society'and the day will come when We all will be a mere memory on a picture tuct away in a old dusty attic, to one day be taken down for nobody to remember who We were;write Your book and let the past live on. God bless You. Thanks for sharing. Thanks for your comments! My 85 year old mom just passed away in February. As we are all gathering more to sort thing out, we are doing a lot of remembering. Do you remember what it was like to have a dog and just let him outdoors? I do. My boxer, Duke, was King of the Neighborhood. No leash laws. We'd just open the door and off he'd go on his adventures. Life was so different back then. Thanks for sharing your memories. This is a treasure! Good reading. After my mom died, I found a story that she had written about a time that she went to her gramma's house as a little girl, all in her own words. So wonderful. I wish she had shared it with us and we could have talked about it more. :( Your mom must love the storytelling. Way to go! What a beautiful testament to Glenda. onegoodwoman, Now I understand why you use the term, "onegoodwoman." You have great tastes! You had my attention at the Great Depression. By the Ozarks , you had me captured........going on to Chapter 2. Thanks. I learn about myself as I explore and research my mother's background. My mother is an unusual pioneer, and resilient individual. I am proud to be her son. The "commercialization," making a book does not have a financial motive, or considerations. It is a labor of love and family and the process of self-discovery. Voted this up. The grapes of wrath made a lasting impression on me. Your account makes it really come alive.This is going to make a wonderful read for future generations of your family. Bakersfield: Home of Merle Haggard and Buck Owens... A great place to be from..! My wife was born in Bakersfield, and her parents were refugees but later in time, from Oklahoma and Arkansas, after the dust bowl. RunAbstract, Our "roots" from our families run deep and are grounded in love. Thank you so much for inviting me to read this wonderful memoir! I will be back soon to read the second installment! Wonderful photos! The story made me feel as if I was transported back to your mom's time. This was great and well told. It would make a terrific book. bayoulady, I hope you are right! Thanks! heartgripping!looks like the making of a fantastic book. the pictures are great! marisuewrites, Thanks! Life is more about how we respond to our "challenges." Thanks for sharing...! we learn and grow --tuff times teach us!! I never heard anything about my dad, Phillip as i was growing up and his childhood. Nothing was ever shared. I will keep reading. Dolores Monet, They are the "Salt of The Earth.." The "bedrock" upon which we have built a better society. There are others who now are experiencing "difficult" times. I hope they respond as my ancestors did and build upon the "work" ethic of the world does not "owe" you a "living." Welfare is not a salary. My ancestors did not, would not accept government help, or public assistance. The difficulties endured by the people of the Ozarks during the Great Depression should not be forgotten. It's a lesson for us all, to to to understand how hard life was for them, and how cruel people looked down on them for their hard times. You are so lucky to still have your mother. What a woman! NamVetRich, I have a medal, but I was not really in, or around Viet Nam.. Was in Joint Chief of Staff-Far East-Crypto... Traveled a lot "incognito..."
Dallas, you really have a great talent for narrative, reading this was like being right there. Glad to here your mom is doing good, I went home two weeks ago for my mothers 84, and like yours she is still going strong, like she say's the deracell battery. katiem2, One's past is the key to their future... Thanks for sharing! WOW dallas, what a treasure for all your family members and what a treat for use, this is pure magic. I love it! I can't wait to read on. The photos are so fantastic and remaster perfectly. What a pleasure, Thank You and your Mom! SilverGenes, My grandmother believed and insisted on their living place (even though it had no roof) was clean. Grandma at first washed their only dress and undies every night. Later, as the children got older, the children washed their clothes in the evening before going to bed... I fared much better. Even though I grew up with a single pair of shoes, wearing them until the soles "flapped," I had more than one shirt and pair of pants. My mother would sew the heel of my single pair of rotten (wore out) cotton socks every morning before I went to school. This is a story that I can't put down and I'm so glad there is more! The photos are really good but it's the descriptions of the doors wide open and boiling water for the floor that brings everything to life. She was eleven before she saw her own mother smile - that got to me. Thank you for sharing this with us. MartieCoetser, To learn from the past has created the freedom to make "different mistakes" in the present and different mistakes in the future. I want to learn to expect different results by doing things differently... Thanks for sharing. Dallas, I read this 1st hub of your series on this Sunday morning with a smile. It is so wonderful to know and remember where we come from. No matter how modest our background, we are proud of it, for knowing the circumstances of our predecessors we evaluate the progress we have made and then we are proud as well as grateful. Currently, I believe, we live in luxury. Great hub! I'm looking forward to read the next one. Sounds like the start of a great book! Keep up the good work! Interesting reading. I story that needs to be told. I will be looking for the other chapters. Thanks. sarmack, When I first heard the comment, "It takes a village to raise a child," I did not know, or understand the implications. As I mature, I understand the ramifications. Family is important as is a "friend" network... Thanks for stopping by... I glanced at your hubs and you have some great ones! Thank you for helping your mother with her story! You have helped her to leave part of her legacy for your family! Nellieanna, Science "stuff" is a language as any area of activities, or disciplines have. An example: Rock Stars have their "lingo," Interior Designers are all into "textures & colors." Focus demands specific tools to communicate... It is the "fine brush" of life to paint the details needed for our niches in life to provide the experts the tools to communicate among themselves. What we really need is an interpreter! Dallas - it is from these grass-roots and the wisdom and common sense they imparted that you've become the scientific expert who's also able to write about those aspects of modern life & its future so intriguingly well! I heartily recommend that folks take a plunge and read those hubs! It's a challenge, for sure! I suppose that wealth & ease can & do produce great thinkers, doers, innovators, and creative genii, but not nearly in the proportion that more humble, difficult beginnings seem to! Ease often seems satisfied to just sit back and enjoy rather than getting into the fray and contributing, especially when that other alternative would involve sweat, virtue and guts. Nellieanna, your charm, wit, and intellect is amazing. I guess it is true if you want something done, find a "busy" person to do it! Thanks for sending this to me. I remember sitting there hearing them all talk about the past, as we grew up. I wish Dad (Uncle Laury) was there to tell his also. Again, thanks love. Dallas thank you for this amazing share through your mother's eyes and voice. I some what feel I lived some of those parts in my younger years as a boy growing up in poverty and living from hand to mouth day to day. YES - I'm still reading! And I came back from trying to catch up other hub reading to be sure to vote these UP and awesome and beautiful. They really don't have adequate words of praise, but these depict many glorious ones. Yes! Nellieanna, We share a humble, "salt-of-the-earth" heritage. It produced strong, resilient, independent "roots" that are "grounded" deeply... I hope your last sentence is correct! Thanks, your words of encourage are appreciated! Ralwus, It is a different era where "hardship" was the norm. Spoken from a narrative voice who was there... Thanks for your comments. I appreciate them. Oh my - I have tears in my eyes, Dallas. So many things. One of the first things I noticed is that your mother's and mine have birthdays close; quite different years, however, my mother's was December 17, 1892, but the Sagittarian directness, quickness, verve, passion, fire and high-strung will seem common to them both!! And your mother's birth is only 4 years or so before my own! And when she was being born in Midland, my folks were struggling not so terribly farther south nearer the Mexican border but in almost the same exact longitude to acquire, build & hang on to a ranch which they'd been able to buy by that water well drilling across that arid desert for the years from the early 20s forward. Of course, the closer to the Rio Grande, the more canyons change the landscape, feeding the scarse rain waters into that big river! They also started "from scratch" - having only their own faith, determination & willingness to work unbelieveable hours under impossible conditions. They acquired the ranch I now own a bit later, nearer the time of my birth. But so many dates and events in our stories are similar. Your telling it and including her own accounts of it is magnificent. This looks to me like the seed of a great literary masterpiece. I am still reading! !